About: Founded in 2001, the Consortium of Universities for the Advancement of Hydrologic Science, Inc. (CUAHSI) is an alliance of over 130 colleges, universities and other research institutions leading the effort to shape the future of hydrologic science by strengthening multidisciplinary collaboration, developing and operating research infrastructure, and promoting water education and training. Current Projects: CUAHSI operates the CUAHSI Water Data Center (WDC), which is a data facility that enables sharing and reuse of hydrologic data. The main effort is the development of the Hydrologic Information System (HIS) that enables the publication and discovery of environmental time series data. The system consists of a server-side solution for publishing data as data services, a metadata catalog to index data services and tools for accessing data. A primary mission of the WDC as a National Science Foundation supported data facility is to preserve and provide access to “long tail” water related data in support of the National Science Foundation’s requirement for data management plans. In addition the WDC facilitates access to content rich web services, such as those from U.S. Federal Agencies (e.g. USGS, NASA, EPA, NOAA, etc. ), in a standardized format. Finally, through the WDC, CUAHSI supports the development of data-driven education initiatives. Data published through the WDC can be accessed by visiting the URL http://data.cuahsi.org. Why CUAHSI participates in ESIP: CUAHSI joined ESIP to cooperate with other data facilities to collaborate on technical implementations of data sharing solutions. 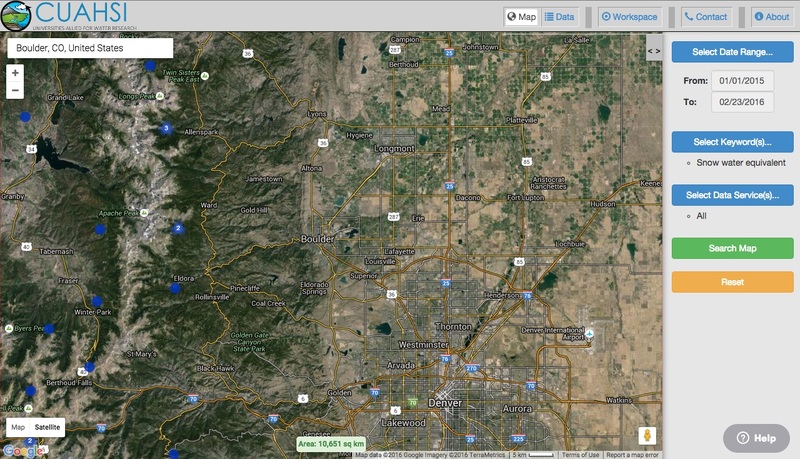 Image: data.cuahsi.org interface displaying Snow Water Equivalent (SWE) data points centered around Boulder, CO.